I was going to use up some of my yarn stash, yarn left from blanket making about three years ago. I found a jacket pattern and picked up sticks. It started well, growing quickly, that was the idea, get rid of it quick then treat myself to another woolly purchase and not feel guilty that my stash could rival a yarn stores’. Then I noticed a mistake half way down one front panel. I ripped it back and corrected it. 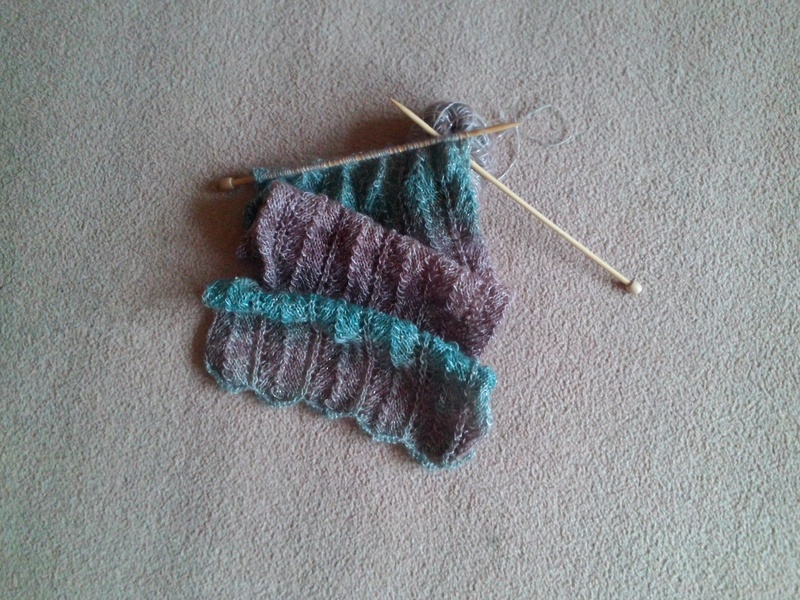 I knit a little further. So I still have that part of my stash and who knows what it may turn into. The world of knitting patterns is vast. My own imagination runs riot. One day this will make one or several successful items, maybe just not this week. I am sure I am not the only one who has the odd disaster. I would love to read about others so I don’t feel so alone, though I do look at is as an opportunity rather than a complete disaster, at least I hadn’t finished it then found the mistake or realised it looked so horrid! As a stop gap, I finished another hat for a friend’s charity sale. Baby size, quick knit, scraps from my stash. You could say I am slowly depleting my yarn stash, SLOWLY being the word. Did anyone else here go to the Creative Craft Show at Excel in London last weekend. Lots to admire, some Christmas treats purchased, lovely people met and business cards taken away for future shopping. I resisted adding to my yarn stash – I guess that was another success for the week. Thinking positive! This entry was posted in Uncategorized and tagged Creative Craft Show, Excel, hat, knit, stash, yarn. English is a funny language. I was meandering around the internet and was going to blog saying ‘life is like a bowl of cherries’ as I was having a good day, had enjoyed great company and so on. Then I decided to actually do my own mini research about the saying and I realised someone could misinterpret my words. You see, those actual words, ‘life is like a bowl of cherries’ are often used sarcastically or humorously as an idiom or turn of phrase whereas I have always used them at face value. I don’t think I have ever turned them around. You see, I would think it is akin to taking from a luscious bowl of juicy fruit. If you dive in then you take a chance on something nice. Dive in once, one chance, dive in twice, two and so on. So, if life is like a bowl of cherries then life is good. It is good today – if my earlier companion is reading this! What about ‘honesty is the best policy’? Is it? I tend to think so but I can waver on this one. When asked ‘does my bum look big in this?’ I might not answer exactly, but if I did think the vision unflattering I would suggest a change of outfit as the person may look better in something different. I wouldn’t say they had a big rear, but would be kinder with my words. Remembering a recent shopping trip with a friend makes me giggle. I picked up a pair of trousers and asked her if she thought I could wear them. Her answer was ‘not when with me’. We roared with laughter so much the shop assistant frowned at the disturbance of her peace! At another angle, I am definitely a ‘glass half full’ kind of person. I have been told I have a sunny personality, I hope I think in more positive ways than negative. Even saying ‘glass half full’ could start a discussion about proverbial phrases and are you a ‘half full’ or ‘half empty’ type. Which, if any, is correct? Proverbs, another whole host of sayings that can get confusing. ‘A watched pot never boils’ – yes it does if it’s on the correct heat source and you don’t take your eyes off it! ‘Absence makes the heart grow fonder’ – yes it can (in my family it does) but sometimes it makes you realise you aren’t looking forward to that person coming back! You see, just a couple of strange examples here. I could spout for hours. I enjoyed English at school, one of my favourite subjects. Perhaps I need to go back to learn how to use it properly. A little of what you fancy does you good…. This entry was posted in Uncategorized and tagged English, idiom, knit, Liberty lawn, proverb, sayings. It’s wonderful to grab some winter sunshine when the UK is starting to turn grey. I have recently returned from the lovely island of Antigua. It was a week of R&R, quality time spent with hubby and memories to keep me going as the days turn shorter, the temperature declines and Christmas tunes start playing in each and every corner. Browsing through recent snaps I also looked at photos of a holiday in September last year. It was a wonderful trip to Mauritius. Again, a week of R&R. (Very indulgent, very lucky I know.) Being particularly self critical (who isn’t when faced with themselves in swimwear?! ), I hate every photo of myself as I had never been as big as I was then. It inspired me to lose weight, which has been a steady journey and occasionally I can remind myself on days like today, that it has been worth it. I am lighter, a dress size smaller and I feel fitter than I have for a long time. Yes I fall off the sensible eating wagon sometimes but overall it’s going the right way. As regards crafting progress: Over the last few months I had been slacking and I wasn’t particularly proud of myself. I couldn’t settle into anything. I got distracted easily, switching between a little knitting, going wrong, ripping it back, reknitting, summer projects didn’t get finished, last winter’s projects still lay half done. I tried to sew, I cut fabric out. cut wrong, changed projects, didn’t do it well. I embroidered a bit, not a lot, I even tried to tackle a sweet little embroidery that’s been in a hoop for several years. Nothing was working. Now it’s November and a good friend needs hats for a charity sale. It’s got me back into knitting and I have to say SUCCESSFULLY FINISHING too. I am using up some yarn scraps. The styles and sizes are flexible. I love stripes and pompoms so I guess there will be a few more like these. All in all it’s a perfect start to hopefully a good winter and a good winter knitting season. I knit more in the winter. I expect many of us do. Do you? Here’s wishing you all a happy November. This entry was posted in Uncategorized and tagged antigua, crafting., diet, embroider, green island, holiday, knit, sew, stash, sunshine.